A short while ago, we adopted a shelter dog, a young female German Shepherd Dog, named Sage (Seichi). Although she was a wonderful dog in many respects, her intensity and high prey drive didn't work out for us. We believed our cats to be at risk, and my own mental health, in a fragile state because of the recent parole hearing of the man who'd raped and murdered my mother, showed worrisome signs. So we returned her to the (no-kill) shelter, along with a detailed report of our experience and progress with her. Seichi is a lovely, affectionate, highly intelligent dog. 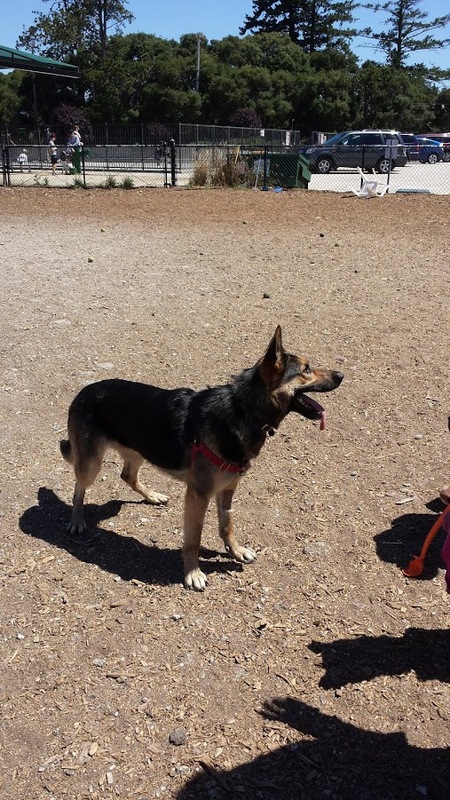 She has a very high prey drive and is eager to please, but needs a home without cats or small children, and an owner who is experienced in training GSDs with positive, non-force methods. Even so, I experienced second thoughts. Had I given up on her too soon? What if no one else adopts her -- or the wrong person does, and attempts to overpower her with force? Should we give her another try? And each time, I had to talk myself down from those doubts, reminding myself of my own limitations. My husband kept reminding me, too. Yesterday, we got an email from Seichi's special volunteer handler at the shelter. Not only had she been adopted but she will be trained in search and rescue work, focusing on finding victims in collapsed buildings! I am relieved beyond words. Not only will she have the kind of work that will give her focus and joy (since German Shepherd Dogs are working dogs and need a job!) but she will have a better life than we could give her. And she'll be saving human lives. Sometimes what looks like a bad situation turns out to be a blessing. Wow, that's wonderful news! What a great new life for Seichi, and it lets her prey drive work for her, rather than against her. Great! I'm so glad that all worked out so well. That's such good news. She clearly needed a job. Very happy to hear this! My mom always used to say that everything always works out for the best. I guess sometimes it really does.